Celebrate your tribe and the place you call home with this personalized family and state print. You may have settled along the Appalachian Trail or in a Seattle high rise, but what really makes a place special are the people who live there. 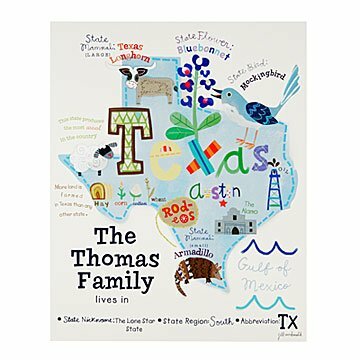 Celebrate your unique tribe and the place you call home with this personalized family and state print. Each whimsical design incorporates your state's unique features from lakes and rivers to cities and landmarks, as well as a proud display of your family's name. Whether you stay perched where you are or eventually move somewhere new, this one-of-a-kind keepsake is a great reminder of the memories you've made. Designed and made by Jill McDonald in Missouri. Meet Jill and learn how she handles her own studio and motherhood "like a boss" on our blog. You might have passed by Jill McDonald’s work in a store front or on a book cover. But before she designed for some of our nation’s top brands, Jill was a Midwestern girl who loved drawing and playing with bold colors. When it came time for college, she attended the Rhode Island School of Design where she studied textile design. She then hit the Big Apple to create a wide range of products from bedding to puzzles before starting her own design studio. Much of Jill’s work has an educational component or serves as a source of inspiration (see her “I Think I Can” print). When she’s not dreaming up color and pattern combinations, she enjoys practicing yoga, picking flowers, and spending time with her husband and son. She lives in Kansas City. This is a made-to-order item. If you order today your item will ship no later than 5/1/2019.